The beauty of finally seeing a local production of the all-time Tony Award-winning musical The Producers is in its confirmation that Mel Brook's over-the-top production numbers and general inanity can be handled with consummate satisfaction by locals, especially a group as talented as Boulder's Dinner Theatre. If you've only seen the recent Susan Stroman film or, G-d forbid, the 1968 film upon which the musical was based, you need to get out and see how Brooks turned a so-so comedy into a tour de force stage farce. In the program notes, BDT artistic director/producer Michael J. Duran remarks that when he considered the show for his company, he knew he had the right people for the job—and his judgment is certainly borne out by this production. Wayne Kennedy, as Max Bialystock, a shameless Broadway producer who schtups old ladies to fund his tasteless musicals, and Scott Beyette, as Leo Bloom, the painfully neurotic, slump shouldered, inhibited accountant—who have worked together for years, but never directly opposite each other until now—are a match worthy of the Nathan Lane and Matthew Broderick dynamic duo that created these roles. Kennedy uses every trick in his sophisticated arsenal—including goofy, melodramatic, absurd, schmaltzy, and conniving—to infuse the ever-scheming Max with a personality as big as the Great White Way. His formidable tenor and imaginative physicality leave us incredulous in "Betrayed," where he acts out all the key events of the story in less than 90 seconds. After Bloom explains that, "Under the right circumstances, a producer could make more money with a flop than he could with a hit," Max takes Bloom under his wing and the story takes flight, as the newly minted partnership scours Manhattan in search of the worst possible script and director. The debonaire Beyette's inhabitation of the poor shlump Bloom is astonishingly funny as well as a quirky counterbalance to Kennedy's irrepressible Max. It is Bloom's arc that defines the story, and Beyette finds the perfect pitch of unassuming naivete to make this work, kicking the show into high-gear with the first in a series of spoofs of Busby Berkeley-type production numbers, "I Wanna Be a Producer," featuring show girls emerging from the file cabinets of his accounting office, accented with glitter, tap dancing, top hat, silk scarf, and champagne glasses. Brooks shows no favoritism in his consistent politically incorrect script, making fun of every ethnicity he can weave into the story, beginning with Bialystock and Bloom, two meshugge Jews. To this he adds: a passive-aggressive German admirer of Hitler, a wild and silly Brian Jackson; a gorgeous and uninhibited Swedish bombshell, a wide-eyed and delicious Zina Mercil; and an array of flambouyant queens and an enigmatic dyke, a willowy Brian Norber, a withering Matthew D. Peters, and a winning Shelly Cox-Robie. The six-piece band, led by Neil Dunfee, Amy Campion's inventive set, Linda Morken's impressive costumes, and Alica Dunfee's energetic choreography round out the sparkling production. 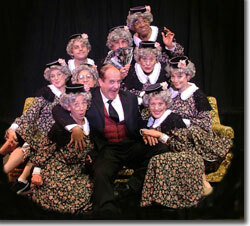 Boulder's Dinner Theatre's production of The Producers runs through March 7th. 303-449-6000.